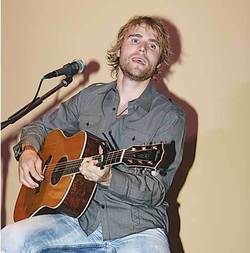 Country artist Adam Gregory was the featured performer at the 4th Annual Boys & Girls Club Gala & Fundraiser. Adam performed an acoustic set partnered with just his guitar, much to the enjoyment of the crowd. The 4th Annual Fundraiser and Dinner Gala for the Leduc Boys & Girls Club took place at RedTail Landing Golf Course on Saturday May 4th, with a wonderful turnout of 132 attendees anxious to support this great organization. Emceed by The One FM's Jenn Dalen, she gave everyone time to visit, grab a drink and scope out all the silent auction items lining two sides of the banquet room before starting the program for the evening. A local rising star in the form of 14 year old Brendan Guy warmed up the crowd with almost an hour's worth of music consisting of both covers and originals from his recently completed three song EP. Brendan was the perfect choice for this event because he is a great example of what a motivated and supported young person can achieve, and got everyone singing along and swaying to the tunes in their chairs. After Brendan was applauded from the stage, dinner was served. A great buffet of choices including Greek and Caesar salads, spiced roasted potatoes and every Albertan's favourite, roast beef, not to mention a stellar dessert table, was well appreciated by the attendees. Once everyone was sated with the fabulous food, the evening's guest auctioneer, Mr. Harry Pedersen, kept everyone in stitches with his hysterical patter in between cleaning out the room's wallets. The first items up for auction were three designer cakes created by Courtney Cakes. Each of the edible works of art sold for between $100-200 dollars. Some of the other incredible items being offered at live auction were two large solariums, donated by Canadian Tire, that were up for grabs. They both sold for $2,700.00 each with one being snapped up by Mayor and Mrs. Krischke. Four tickets and a personal meet and greet to the Stars On Ice sold for $940.00, and a handmade steel fire pit with the Boys & Girls Club Logo emblazoned on the side brought in $800.00. At the completion of the live auction, Board of Directors President Dr. Bretton Baynes came to the podium to present gifts to three young ladies who were graduating out of the Club this year. Veronica DeVos, Alexandria Wolfe, and Caline Strach were each brought onto the stage and presented with personalized memory boxes stamped with the Boys & Girls Club logo and the inscription "Thanks For The Memories". Dr. Baynes then took the opportunity to introduce the Club's new Executive Director Gord Sands. Gord stated that for him, this job was a dream come true. He comes from a policing background where he was heavily involved in youth programs, and more recently he had been the Executive Director for Leduc's Victims Services. Always having a passion for kids he shared that his first week had been pretty overwhelming with an extremely steep learning curve, but he knew he was in the right place when the following happened. Gord told the story of how a young girl named Eva strode into his office one afternoon about three days into his first week and stood there staring at him with a serious but quizzical look on her face. He came around from behind his desk asking her if everything was okay and Eva replied, "You kinda look like my grandpa, and I love my grandpa." And promptly gave him a huge hug. "How can you not love a job with those kind of perks?" Laughed Gord. Even though it's extremely hard to follow and top a story like that, the evening's main entertainer was just the one to fill the bill. Country music sensation Adam Gregory, accompanied by just his acoustic guitar, took over the stage and held the audience rapt for the rest of the evening. By all accounts the 4th Annual Boys & Girls Club Fundraiser and Gala was a huge success. Their theme of "It Takes A Village" was extremely well supported by the "village" of Leduc. And as Gord stated at the end of his speech, "It takes a community to run this program" and Leduc and area proved once again they are a fantastic community, and the Leduc Boys and Girls Club is a fantastic program!